Students don’t know how to assess work – we are the professionals, they aren’t! They’re sensitive about their friends reading their work. They’re not sure how to mark/what to say. They’re not clear on what’s good/what’s not. They give vague/unhelpful feedback, because they don’t know where/how the feedback should be focused. It doesn’t help them to understand the important areas of weakness and how to move on. So as a process, it’s not always that useful. In fact, it can often be damaging and compound misconceptions. 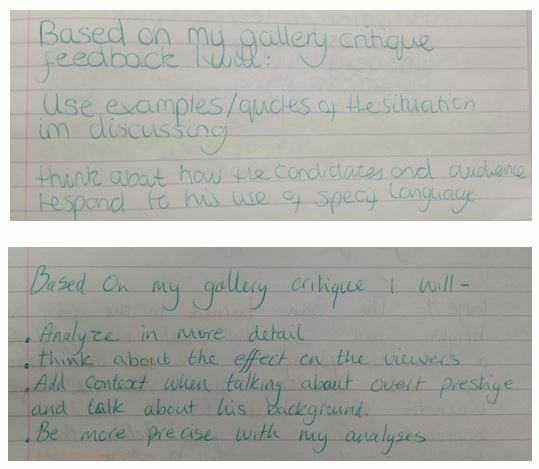 Gallery critique, where students spend an extended period of time reading and assessing the work of their peers, as well as giving high quality feedback, seems to be a far more purposeful alternative. It takes preparation- spend time on the piece of work you want students to mark. Make sure that the outcome will be a substantial piece of work, that lends itself clearly to the success criteria. Before students start on the task, make students aware that their work will be read/assessed by others in the class. This definitely seems to make a difference to the care and attention that they give to their work – because it has an audience and a purpose. 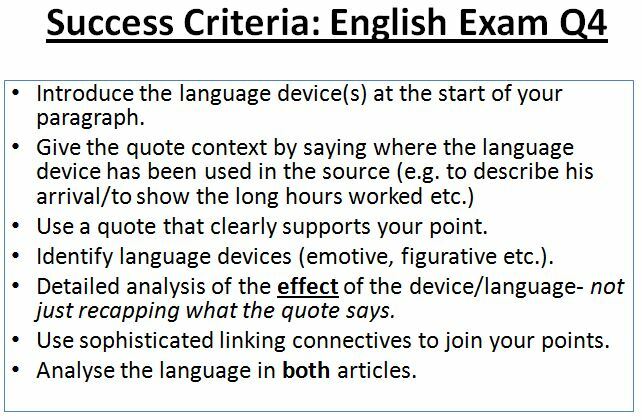 Have student friendly success criteria printed for all students and discuss this clearly with them e.g. Recap the success criteria before you start assessing. Place each piece of student work to be assessed on a table, spaced out around the room (like a gallery!) and ask each student to go to a piece of work that isn’t theirs. Give each student lots of post it notes. Insist that students then read the piece of work in silence. 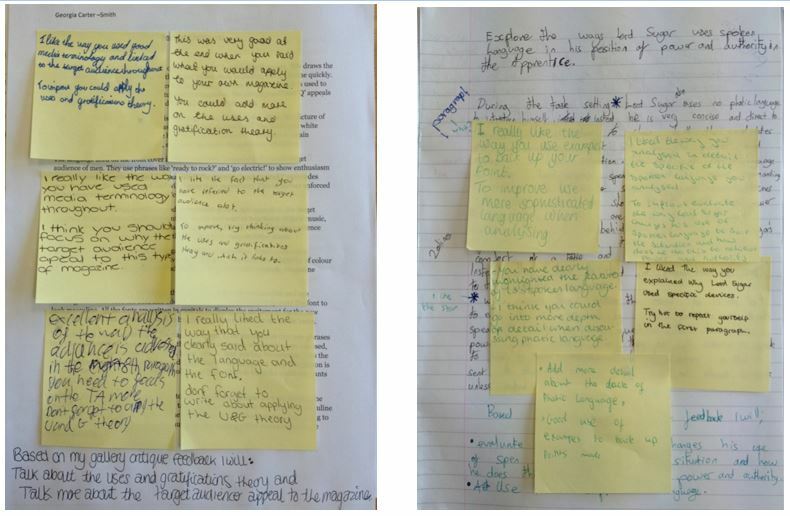 They write their feedback on post its and stick them on to the piece of work. When they have completed their assessment and feedback, they move over to the next piece. They usually get through roughly 5 in 30- 40mins (depending on length). Students return to their place and read the feedback given. Each student should have at least 4 or 5 pieces of feedback, depending on how many rotations you did. 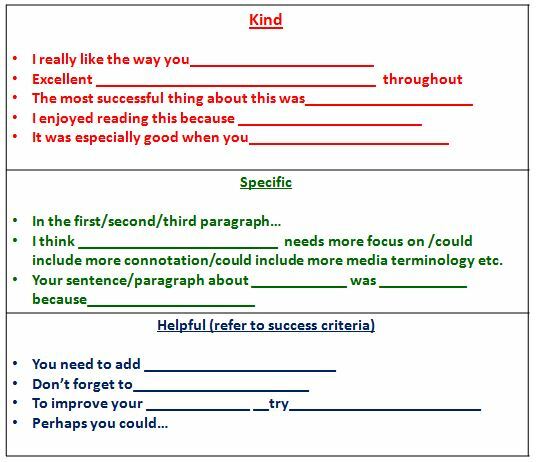 This is worth doing – as from a practical point of view, the post its tend to fall off – and so the valuable feedback goes with it! 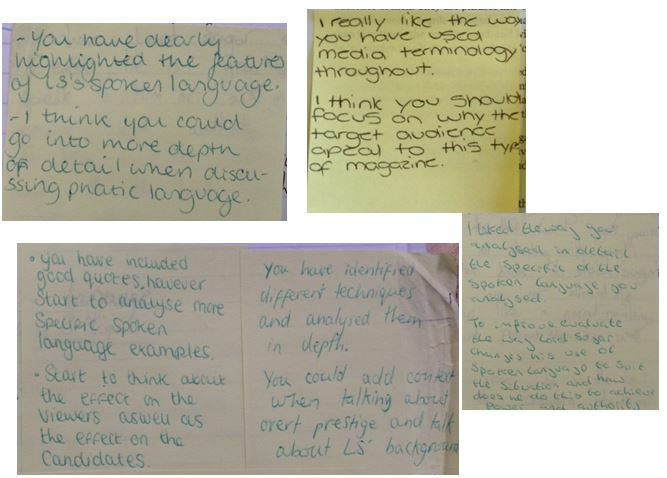 Next lesson they address their targets, by redrafting their work, based on the feedback they have been given. It helps students to better understand the criteria/demands of a task. It gives their work a purpose and an audience – this definitely makes them put more effort into the work. They learn from reading a range of different answers. They get an idea of what’s great and why. They take it seriously as they feel responsible for each others work. 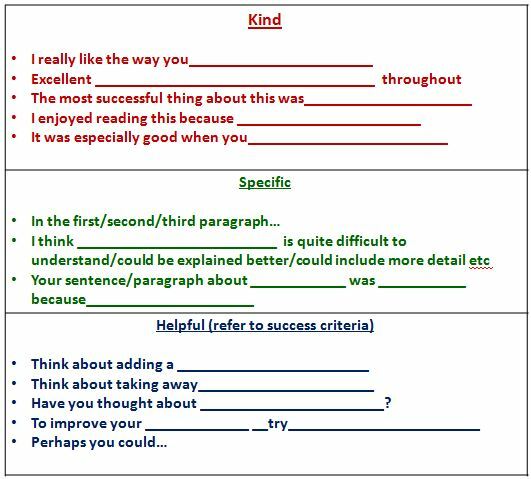 It makes them respond to feedback and so improve their work. They like working in silence – it gives them a real sense of purpose and focus. Because of the work done beforehand e.g. discussing the success criteria and the ‘kind, specific & helpful’ feedback guidance, their work is marked thoroughly and they receive helpful, high quality feedback. Gives peer assessment a real focus and kudos. It’s anonymous- there’s no stigma (plus they’re too focused on reading and marking). It can work across a range of subjects. The description outlined here is with a written task in English, but it could just as easily be done with pieces of art or PE/drama performances, by filming them and then playing them back on a number of tablets. This entry was posted in 15 Minute Forums, General Teaching and tagged Feedback, Gallery critique. Bookmark the permalink. Gallery Critique – a better way to peer assess! Really good advice. I get students to peer assess a lot. This post has made me think about fine tuning that process. Thank you.